man county, where Mr. Tracy purchased an improved farm of one hundred and sixty acres on section twenty-six, township sixteen, range fifteen, and also took up a tree claim adjoining, thus securing the entire southern half of section twenty-six. He continued to improve and cultivate this farm until 1889, when he returned to his native state, at the time of his marriage to Mary R. Whited, who had been his houskeeper in his Nebraska home. He then resumed his residence in the Empire state. His children were as follows: David A., of Maryland; Chester J., of Loup City; Eugene E., the immediate subject of this article; William T., of New York state; Ida, now Mrs. H. E. Brewer, of Salt Lake City, Utah; Minnie, now Mrs. J. Q. Pray, of Sherman county; Lucius W., of Rock Falls, Illinois. 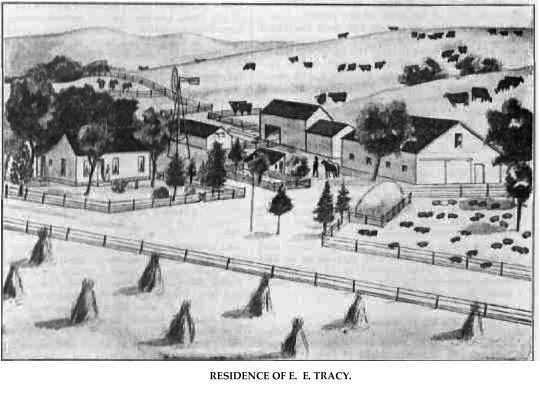 Eugene E. Tracy has lived on the original farm purchased by his father, since coming west as a boy, and passed through the usual experiences of the pioneers. We are pleased to present for inspection a view of the home place on another page of this work. Land that formerly sold at two dollars and a half per acre is now worth from seventy-five to one hundred and fifty dollars, and this is but one instance that indicates the great change that has taken place. Mr. Tracy has held many township offices, having served as clerk, assessor, justice of the peace, and for a number of years has served as director of school district number ten, the school building being located on the Tracy farm. Mr. Tracy was married March 3, 1903, to Elizabeth Kay, at the home of her parents, David and Caroline Kay, on section ten, near the Tracy home. The Kays, of whom we elsewhere write more at length, were among the early settlers of the region, and Mrs. Tracy, as well as her husband, has been through the hardships and privations incident to pioneer life. Both are well known in the community, where they have many friends, and are highly esteemed. They have one child, Viola Marie. Mr. Tracy, with his family, is a member of the Presbyterian church. He is a republican in politics, and a member of the Knights of Pythias. When the Tracy family first came to Nebraska, hundreds of deer and antelope were to be seen in the country. Mr. Tracy was once mowing when deer started up from the tall grass and frightened his team. At another time two fawns were seen in the canyons near the house. One of these a sheep dog caught, and Mr. Tracy tied it with his handkerchief, and started on to find the other one. This proving to be a fruitless chase, he returned for the first one, and found it gone, thus losing both of them. For nearly forty years the above mentioned gentleman has been a resident of Nebraska, since 1890 he has lived in Valley county, being the proprietor of a valuable farm, comprising more than three hundred acres, in section twenty-nine, township seventeen, range thirteen. He is a progressive and enterprising citizen and farmer, and a man of sterling integrity. Mr. Van Osdol was born on March 4, 1856, in Switzerland county, Indiana. His father, James M. Van Osdol, was of Dutch descent, but a native-born Kentuckian. He died in 1896 in Shelby county, Missouri. The mother, Eliza Ferris Van Osdol, was of Irish ancestry, born in Kentucky. In May, 1856, while an infant, Mr. Van Osdol was taken to Shelby county, Missouri, by his parents, in which state he spent his childhood, receiving the usual school advantages in the local schools. In the spring of 1874, he came to Otoe county, Nebraska, where he was engaged in farm labor for six years, and then, in 1880, went to Norden county, Kansas, where he remained three years, long enough to prove up on one hundred and twenty acres. He then returned to Nebraska, and farmed on rented land in Adams county for three years, and from 1887 to 1890 farmed in Norden county, Kansas. In the fall of 1890, he came to Valley county, where he had worked in 1886, and has been a resident of that locality ever since, renting three years on Davis creek. He then leased a school section west of his present home, where he lived from the fall of 1893 until the fall of 1899. In 1898, Mr. Van Osdol purchased three hundred and twenty acres of fine land, the east half of section twenty-nine, township seventeen, range thirteen, which was known as the Ashland farm, on which he moved in 1899. The farm was valuable even in those days, when raw, unimproved land, and is worth far more now, owing to the general advance in the price of land, and also to the amount of improvements he has made. A beautiful, modern home, heated by the hot-water system, was built in 1907, a large barn having been built each of the two preceding years, and all are in good condition. A view of this modern farm place, with its beautiful view of hill and valley, is to be found adorning another page of our work. in this part of the country. Mr. Van Osdol has always displayed a commendable interest in local public affairs, and has served as school treasurer of his district for several years. He is now one of the directors, and has gained well-merited recognition as a worthy citizen. The family has had the pioneer privilege of living in a sod house, occupying a dwelling of that construction while cultivating the school land, and their first home on Ashland Farm was built of sod, with a straw stable to shelter their stock. Mr. Van Osdol was out in the blizzard of October, 1880, and also that of January 12, 1888. In the latter, some of his cattle were snowed under two days and three nights, and all but three survived. In the fearful year of drouth, 1894, Mr. Van Osdol raised three hundred bushels of wheat, probably the most bountiful harvest in all this region. He well remembers the cloudburst and flood of June, 1896, when everything in the low lands was swept away. 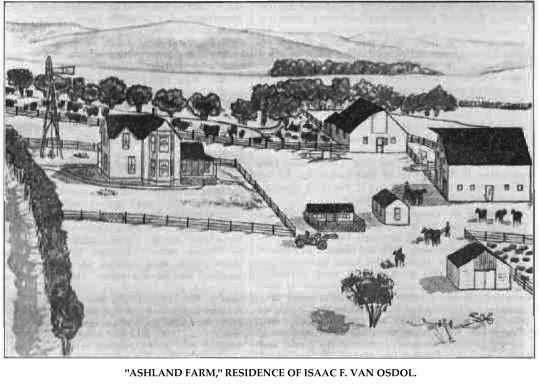 "Ashland Farm," Residence of Isaac F. Van Osdol. The gentleman above mentioned is counted among the oldest settlers in the state of Nebraska, locating in Plattsmouth, Cass county, in 1885, where he resided until coming to Pierce county in 1891, and has taken a foremost part in the development of this region. He has built up a good home and farm in section six, township twenty-seven, range one, where he owns six hundred and forty acres of land, six acres being planted to trees. Mr. Volk was born in Pekin, Illinois, January 6, 1859, where he grew to manhood and obtained a good schooling. Mr. Volk's father, Nicholas Volk, was born in 1819 in Hesse-Damstadt [sic], Germany. He was a carpenter by trade, as well as a cabinet-maker, and served his native country the usual period in the army. The mother, Maggie (Urish) Volk, was also a native of Hesse Darmstadt, born about 1827, the family emigrating to America some three years later. She died at the age of eighty-three years. Our subject's parents were married in Tazewell county, Illinois, where they lived on a farm. Mr. Volk was united in holy matrimony in 1884 to Miss Lizzie Hill, and they are the parents of seven children, whose names are as follows: John, Sophie, Anna, Edward, Jesse, William and Elmer. Mrs. Volk's parents are old settlers in Illinois, coming from Germany in the early days. Mr. Volk is widely known throughout this section of the country as a man who is always ready and willing to do for the better interests of his part of the state. He is a hard-working and industrious citizen, well liked by all who know him. On July 7, 1903, there passed from this life in St. Paul precinct, Howard county, Nebraska, Frederick Augustus Stewart, a man who in a peculiarly personal way linked the earlier part of the past century with the present, as a leading citizen of affairs. He had given the greater part of his career to the upbuilding of his region, and took especial pride in the advancement and betterment of the interests of his county and state. The subject of this sketch was born in Herkimer county, New York, May 16, 1827. He made that state his home until he was twenty-seven years of age, and was married there in 1854 to Lucretia Brown, also a native of New York. Shortly after their marriage, they settled in McHenry county, Illinois, where Mr. Stewart engaged in farming and stock-raising. Illinois at this time was in its early stages of civilization, and our subject and his wife were among the earliest pioneers in their section. After a number of years there, they moved into Wisconsin, which was just across the line from McHenry county, Illinois, and remained there up to 1877, when they moved to Rock Island county, Illinois. They remained until 1881, at which time Mr. and Mrs. Stewart came into Howard county, where for one year they rented, and then purchased some land. His farm was situated on section nineteen, township fourteen, range ten, and was a good farming section, which he built up in splendid shape, making of it a very productive farm, and he accumulated a nice little fortune since locating here, at the time of his death, in July, 1903, owning two hundred and eighty acres of good land, fitted up with good buildings and improvements of all kinds. At one time Mr. Stewart owned about nine hundred acres. Mr. Stewart was survived by his wife and four children, three sons and one daughter, namely: Charles H., Jacob O., Fred E. and Francis E., all married, except Charles H., who, with his mother, now resides in St. Paul. The entire family are prominent among Nebraska old-timers, and have been closely identified with the growth and development of their section of the state. brother, Hosea, all returned to Wisconsin together, another brother, George B., being mustered out in the following September. As related in the preceding sketch of Charles R. Rood, Herman Rood, with his brother-in-law and a friend, took up a homestead in the Loup river valley in the fall of 1871, returning soon after to Wisconsin. In November, 1872, Mr. Rood, with Elder Babcock and family, came by rail to Grand island, proceeding from thence to the Loup valley home by team. Mr. Rood remained here for the winter, but in March, 1873, in company with Heman [sic] Babcock, he went to Omaha to work for the city. He remained there but a short time, spending the latter part of that summer in the Minnesota harvest fields. He then returned to Wisconsin, and in May, 1874, Mr. Rood and his sister, Emma, came overland, driving some live stock. Mr. Rood purchased land in the Loup river valley in 1879, and on April 7 of the following year was married to Miss Linda Pierce, at the home of her parents, Mr. and Mrs. Dwight Pierce, in Springdale township. Since that time, with the exception of a year in Grand Island and some months in Wyoming, the North Loup Valley has been the home of Mr. and Mrs. Rood. Mr. Rood has held many different official positions, and at different times has been connected with the mercantile business of North Loup. He is a prominent lodge man, and in many ways has been closely identified with the development and growth of this portion of Nebraska. In past years he has followed the carpenter trade in connection with the management of his farm. He is at present postmaster of North Loup, having been appointed on October 10, 1907. Mr. and Mrs. Rood have one child, S. Inez now married to Otto R. Hill, a farmer living in the locality. Mr. Rood and family are widely known, having a large circle of friends, and are highly esteemed by all who know them. In politics he is republican, is a member of the Masonic order, the Order of the Eastern Star, of the Ancient Order of United Workmen, and the Grand Army of the Republic. Walter G. Rood, born near Dakota, Wisconsin, on June 5, 1864, was the youngest of nine children born to Charles P. and Marianne T. Rood. With his father and mother, he came to Valley county, Nebraska, on July 4, 1875, and resided on the. farm there until January, 1888. The old home on the farm was then burned down, and Mr. Rood and his mother removed to North Loup. He still managed the farm until 1893, and then in August wishing to supply the deficiencies of his early education, which was somewhat limited, went to a college in Milton, Wisconsin, for two years. In 1895, Mr. Rood taught school in West Hallock, Illinois, and for the following five years followed this profession, the last two years being spent in the city schools of North Loup. In April, 1899, Mr. Rood purchased "The Loyalist," the North Loup city newspaper, published weekly, and since that time has been editing this progressive publication. He still resides with his mother at that city. Mr. Rood is a young man of splendid character, especially prominent in educational and religious lines. He is actively interested in the Sabbath school of the Seventhday Baptists, and is a member of the Modern Woodmen of America. He is a republican, in politics, and gives to that party the hearty support of his ably-edited journal. Among the popular residents of Norfolk, Madison county, Nebraska, none is better known or universally esteemed than the gentleman above named. He has for many years been devoted to the interests and upbuilding of his community. Mr. Raasch was born in Koenigsberg, Germany, September 2, 1842, and when he was two years of age, his parents left Germany for America, locating in Tonawana, New York. In the spring of 1845, they moved to Wisconsin, taking up government land near Ixonia, Jefferson county. There Mr. Raasch was raised on a small farm, and received his early schooling. When seventeen years of age, he worked out for eight dollars a month three years, and out of this small pay saved money. On September 2, 1862, Mr. Raasch enlisted in Company B, Twenty-sixth Wisconsin Volunteer Infantry, to go out under General Siegel, and on September 17, the regiment was mustered in. The army experience of Mr. Raasch is a story taken from the heart of the great war - a story of great battles - the tale of a wounded prisoner - escape - recapture - and many long months in hospitals. May 2, 1863, his regiment participated in the great battle of Chancellorsville, a desperate battle of three days. After this battle, some minor engagements occurred; then came that great battle of Gettysburg, July 1, 1863, where Mr. Raasch received a gunshot wound in his left side, and after extreme hardships in field hospitals, both in rebel and union camps, he was taken to Baltimore, and after months in the hospital there, Mr. Raasch and others were taken to the hospital on David's Island, New York, and later on was transferred to the Harvey General Hospital at Madison, Wisconsin. In this hospital Mr. Raasch remained from June, 1864, to March 25, 1865, at which time he received his discharge, and returned to the Wisconsin farm. others at Ixonia, joined the German colony of about forty families that came to what was to be Norfolk, Madison county, Nebraska, and with this colony came August Raasch, driving a team, as this colony came overland by ox team. He had not intended to remain in Norfolk, but on account of the wounds received in war, he was almost compelled to remain in Norfolk to receive proper nursing, and today, after more than forty years has passed, he does not regret his continued residence in Madison county. When that Wisconsin colony came to Norfolk, the country had not even been surveyed into quarter sections. The regular survey was made in the fall of 1866; then those Madison county pioneers drew lots, and settled on their homesteads. Mr. Raasch's first land location was near his father's, but on account of considerable bluffs on this quarter, he gave his father the choice land on their half section, and himself took up the quarter where he resides today, one mile west of Norfolk, where he has a fine and well-equipped farm. On June 19, 1868, Mr. Raasch was appointed postmaster of Norfolk, being the first appointee. He held the office nine months, when he turned it over to Postmaster Marsh. It was on July 3, 1868, at ten o'clock in the morning, when a mail carrier arrived for the first time in Norfolk. Mr. Raasch was elected assessor in 1872, which office he held and creditably filled two years. Prior to 1870, Mr. Raasch assisted in organizing Madison county, and was one of the first county commissioners for the Norfolk district. On June 6, 1872, Mr. Raasch was married to Miss Maria Rohrke, and from this union eleven children were born: Sarah L., wife of L. Dommer, has four children, and resides in Madison county; Obed, married, and living in Madison county, has three children; Agnes, who is holding down a homestead in South Dakota; Ella, a teacher in the German Lutheran school; Martin, in the Lutheran ministry in the state of Washington; William, a farmer in Madison county; Ernest, lives with his father on the home farm; and Leona, Hattie, Darius and Hugo, who reside under the parental roof. August Raasch has done much in the church affairs of his community. For twenty-seven years he has been a director or deacon in the St. Paul Evangelical Lutheran church, and for over twenty years has been the treasurer of this church. He has also held office in his school district. He is a self-made successful man, and his family is of high standing in their community along social, educational and church lines. He is an independent democrat. Hamilton B. Glazier belongs to one of Custer county's best known families, and is himself an original homesteader there. He was born in Winona county, Minnesota, November 9, 1862, son of Isaac Glazier, one of the very early settlers of Custer county. Isaac Glazier was born in Warren county, New York, December 25, 1819, and was reared on his father's farm. On April 9, 1858, he married Emily M. Bollen in Illinois. She was born in the state of New York, May 12, 1831. Before 1860, Mr. Glazier had removed to Olmsted county, Minnesota, and later lived in Wabash county, that state, leaving the latter place May 12, 1879, and proceeding with a "prairie schooner" to Custer county, Nebraska. With him came his wife and their five children: Daniel, Lois Louisa, Hamilton B., Effie Inez and Albert. He took up a homestead on the southwest quarter of section four, township eighteen, range seventeen, and also secured a timber claim. His wife died on the homestead, January 6, 1886, and he passed away there in May, 1890. Their daughter, Effie Inez, died on the farm in August, 1887, and their son, Daniel, in 1895. Hamilton B., Lois Louisa and Albert Glazier still reside on their father's old homestead farm, and Daniel was also an original homesteader. Hamilton B. and his sister, Lois, now own the home place, and in early years were themselves original homesteaders. The old farm, which comprises one of the choice half-section estates of the county, is well located, and has a fine grove of trees. There are several fine belts of timber, which were set out by members of the family during the early years of their residence there, and which add greatly to the appearance and value of the place. The members of the family who still live there derive a good income from the grain and stock farming they carry on, and have a pleasant home. They have a wide circle of friends and acquaintances, and are well regarded by all as representative of the best interests of the community. A. A. Smith is one of the older residents of Wayne county, Nebraska, where he has become a successful and prosperous grain and stock farmer. He represents the best interests of his community, and is known throughout the county as one of the important factors in securing the present agricultural and commercial prosperity that is so beneficial to all its inhabitants. When he located in his present home, he had few neighbors, but he has witnessed a marvelous change in conditions during the past quarter of a century. and Lucetta Smith, both born in Pennsylvania. They were the parents of eight children, of whom A. A. Smith is the first. Mr. Smith spent his childhood and early youth in his native state. He came west in 1877 with his parents, spending about nine years in Kansas, where he assisted his father on the farm. In 1886, he came to Wayne county, and for five years rented land. In 1891, he purchased his present farm from the I. Davenport estate. The land at that time was in a raw state, no improvements having been made. Mr. Smith began to develop his land, and now has one of the valuable estates in the county. He has erected all the buildings, which add to the beauty and value of the place, and now has a beautiful home, with modern comforts and conveniences, and enjoys the fruits of hard work and careful management. He is an intelligent and progressive farmer, stands well with his neighbors, and has many friends throughout the county, where he is well known. Mr. Smith was married in 1885 to Miss Sarah Clark, who was born in Pottawattamie county, Iowa, and is a daughter of S. M. and Elizabeth Clark, natives of Pennsylvania, and Illinois, respectively. Four children have blessed this union, namely: Alma, Lucy, Ernest and Alfred Clark. Mr. Smith's home is pleasantly situated on section eight, township twenty-seven, range three. Charles A. Sweet, the genial postmaster at Creighton, has long been one of the leading citizens of that thriving city. He is a descendant of colonial ancestors who settled in northern New York prior to the revolutionary war. A maternal ancestor was descended from the Scottish nobility. The great-great-grandmother, Catherine (Campbell) Hunter, who came to the colonies with her daughter, Polly, was a cousin of General Fraser, the British general, who was killed in battle near Saratoga during the French and Indian war. Both these ladies were with Miss Jane McRae but a short time before her massacre by the redskins, and were taken by their captors before General Fraser, who tried to persuade his kinswomen to return to Scotland. Mrs. Hunter's father, Archibald Campbell, emigrated to America on account of having embraced the Episcopal faith, which made him unpopular with his relatives in the old country, thus leaving his brother, Lord Lovett, to inherit the title and estates, which his descendants enjoy to this day. Charles A. Sweet was born at Glenn's Falls, Warren county, New York, on August 19, 1848. He was only thirteen years of age at the outbreak of the Civil war, and was eager to enlist, but too young to be taken into the army. However, after two years, he became a member of Company K, Second New York Regiment of Veteran's Cavalry, acting as bugler, and remained with the company for two years, having been a prisoner of war for a few days less than nine months. His regiment embarked at New York, and was transported by sea to Greenesbury Point, going from there to New Orleans, where they joined General Wilson's command at Alma. During his service in the army, Mr. Sweet participated in twenty-seven engagements, fourteen of which amounted to severe battles, including those at Sabine Cross Roads, Pleasant Hill, Yellow Bayou, Cane River Crossing, Franklin, St. Francisville and Bayou Sara. His capture was effected at Fause River, Louisiana, on October 16, 1864, while on Bank's Red River expedition, and his place of imprisonment was at Alexander and at Shreveport, Louisiana. He was at Camp Ford, Texas, for a time, and from there was released, and allowed to join his regiment. Many of the prisoners were offered their freedom if they would swear allegiance to the confederacy and bear arms in that cause, but very few availed themselves of the opportunity. The winter following his return from the war, Mr. Sweet spent in a lumber camp in the mountains in northern New York, employed as a cook, also familiarly called "cook's scorcher." After work was over in the spring, he boarded a boat on the Erie canal, and emigrated to Buffalo, coming to Milwaukee in the fall of that year. There he entered the employ of a firm dealing in oysters, fish, game and poultry, remaining with them for ten years. He quit his position with the company to accept a position as policeman, and for two years walked a beat in the Cream City, then became a guard in a prison near the city. Later he was employed in a roundhouse at Chicago, in the employ of the Chicago and Northwestern railway company. In the spring of 1883, he came west, stopping at Egan, South Dakota, where he worked as a carpenter for two years. employer, as it was simply taking his life in his hands to venture out in that storm, as any of the old-timers who passed through it will testify. In 1893, Mr. Sweet assumed the management of the first creamery in Creighton, putting in a separator and all modern machinery, and manufactured a high grade of butter, for which he found ready sale. At different times he ran the business up to 1898, then accepted a position in the Horton lumber yard, continuing in that work until his appointment as postmaster in February, 1902. He filled the office with credit, and was re-appointed the following term, also in 1910, being now in his third term of office. Mr. Sweet was married in Chicago on September 21, 1870, to Sarah Hayes, who is a native of Montpelier, Vermont. They have had two children, both of whom died in infancy. An adopted daughter, Laura, is her father's chief assistant in the postoffice. She is a musican [sic] of fine abilty, and is possessed of a beautiful high soprano voice, which is well worthy of cultivation. Mr. Sweet is a staunch republican, and his first vote was cast for Lincoln at the time when he as a boy of sixteen years in the army. When a boy of twelve, he remembers well marching with his father in a Lincoln rally in 1860. He is a prominent member of the Grand Army of the Republic, and Mrs. Sweet has served as state president of the Women's Relief Corps. Mr. Sweet is also a member of the Knights of Pythias Lodge and Royal Highlanders. The family all attend the Episcopal church, and are among the popuplar [sic] members of society in their community. Prominent among the old setlers [sic] of Stanton county is the name of William F. Sasse, who has made this region his home for so many years and done his share in developing the agricultural resources of this section of the country. He lives in his beautiful home on section seven, township twenty-two, range three, where he has built up a most valuable estate through his habits of industry and good management. Mr. Sasse is a native of Brandenburg, Germany, and was born in 1862, the son of August and Henrietta Sasse. The father was a fisherman trade. In 1869, when our subscriber was a small child, the parents decided to come to America, "the Promised Land" which they thought might be better suited to help along the poor man than the older countries of Europe. They came to Cuming county, Nebraska, in 1869, but a few months later removed to Stanton county. So it is in the latter county that the subscriber really attained his thinking years, and where he secured his education. He can tell most interesting stories concerning a settler's life on the plains. At that time, Fremont was the nearest market place, and this was many miles away from his home. Grasshoppers and prairie fires together conspired to make the life of the settler a burden. In 1898, Mr. Sasse was united in marriage to Miss Albertina Mantel, and three children have been born to them. They are named as follows: Francis Amelia, Hilda Irene and Albert Edward. All were born here on the old homestead. Mr. Sasse has always taken a commendable interest in the politics of his adopted country, and especially is interested in all local affairs of a public nature. He is a man of industrious habits, and enjoys the confidence and respect of all with whom he comes in contact. W. A. Shepherd, of Antelope county, Nebraska, is numbered among the oldest settlers and leading "old-timers" of northeastern Nebraska, having landed here July 3, 1871. Mr. Shepherd is a prominent citizen of this locality, respected and esteemed by his fellow men. Mr. Shepherd is a native of England, and was born in Yorkshire county, May 20, 1844. His father, Thomas Shepherd, was a farmer in England, and his uncle, William Hall, had the distinction of being a body guard for Lord Wellington. Mr. Shepherd left his native land for America by way of Liverpool to New York, embarking on the sailboat "Old Gike," and was seven weeks on the water, when, after landing in New York in 1850, he started for the west, locating in Grant county, Wisconsin. prairie fires were fought in that period, from which the family had narrow escapes. In 1894, the year of the great drouth, the crops were a failure, being destroyed by the hot winds. Mr. Shepherd was united in marriage, October 21, 1879, to Miss Elizabeth Lory, and Mr. and Mrs. Shepherd are the parents of three children, named as the following: Garnet, Grace and Ruby. Mr. and Mrs. Shepherd and family are enjoying the respect and esteem of their comunity, and are surrounded by a host of acquaintances and warm friends. One of the most prominent, successful and influential farmers and stockmen of central Nebraska is the above named gentleman, who can truly claim to be one of its pioneers. Since coming into the state, when but three years old, he has resided in many different counties, and is familiar with the resources of each. Mr. Doane was born on March 28, 1863, and was the second of five sons born to George W. and Lucinda (Wheeler) Doane. They moved from Madison county, Wisconsin, (the subscriber's birthplace) to Otoe county, Nebraska, in 1866, so that most of his life has been spent in the state. Nebraska was then but a territory, and there were few settlers in this county. The father took up a homestead here, but soon after moved to the northeastern part of the state, making his home in Knox and Cedar counties until his death in 1909. The mother died in Cedar county, December 5, 1906. The principal subject of this sketch grew up to his younger manhood years in Otoe county, living on the old homestead farm until he was twenty-one years of age. He then went to Knox county, later, in the fall of 1907, coming to Custer county, where he purchased land in section eight, township fifteen, range seventeen. He at present controls about six hundred acres, having leased one hundred and sixty acres in section sixteen. He has made many improvements, and now is the proprietor of a well-equipped grain and stock farm, and is an extensive feeder and shipper, having usually more than one hundred and eighty head of cattle to feed. Mr. Doane was married to Miss Sylvia M. Jones, daughter of George and Hannah (Maple) Jones, in Knox county, September 8, 1886. The Jones family, consisting of father and nine children, came to Knox county two years previous to the above date. The father was one of the original homesteaders of Knox county. The mother had died in Iowa a number of years before they moved to Nebraska, but the father lived until December 12, 1908. Three children have been born to Mr. and Mrs. Doane: Hope, Anna, Ivan G. and H. Irwin, all of whom are living, and at home. Mr. Doane may truly be called a self-made young man, and has the respect and esteem of his fellow citizens. He is one of the true pioneers, and has had much to do with the growth and development of agricultural interests in central and eastern Nebraska. In politics Mr. Doane is republican, and is a member of the Odd Fellows lodge at Mason City, having transferred his membership from Knox county. Mr. Doane lived in a log house in Otoe county, and in a "soddy" for some years in Knox. Deer and antelope were plentiful in those days, coming into the fields to feed on the settlers' corn. Mr. Doane was in Cedar county during 1894, the year of drouth, raising but two bushels of corn to the acre, but was fortunate in harvesting a crop of wheat that ran fifteen bushels to the acre in that favored locality. Through exceptionally good management and persistent efforts, the gentleman here named has succeeded in building up a well-developed farm and comfortable home, and is enabled to enjoy the comforts of life. Erwin Dodge, retired farmer, son of Amos and Sarah (Ritubusch) Dodge, was born in Lamoille county, Vermont, two miles from Johnson village, September 30, 1846. He is the eldest of five children, and has one brother residing in McHenry county, Illinois, one sister in Park Ridge, Illinois, and one sister living in Clay county, Nebraska. One sister is deceased as are the father and mother, both of whom were born in Vermont, and died in Illinois. Mr. Dodge lived in Vermont until he was twenty-one years of age, when he came West to McHenry county, Illinois, engaging in farm labor there three years. Then, after living for two years in the old home state, he came with a brother again to McHenry county in 1872, and they were followed by the parents a year later. The father had made a previous trip to this part of the country in the early fifties, and determined to settle there, having sold his farm for that purpose, but on returning home for his family, the vessel he was in experienced so severe a storm on the lakes that he vowed that if he ever got to land, he would never risk his life on the water again. And he did not; his next trip was by rail.